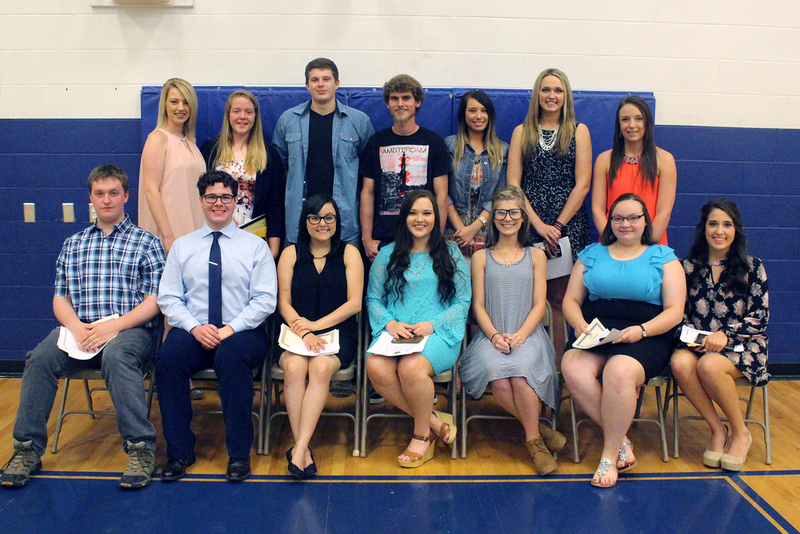 Alton High School is proud to announce that fifteen seniors were awarded scholarships at the Honors Ceremony held Thursday, May 5, 2016. Students receiving scholarships from various colleges, vocational programs, organizations, and families' are (front row) Caleb Buffington, Drew Hufstedler, Bailey Johnston, Kaylee AraSmith, Michaela King, Savannah Simmons, Emily Hower, (back row) Emily Roberts, Mary Alice Oesch, Jed Edwards, Tim Kavanaugh, Ashley Brandon, Haley Kernodle, and Kayley Kepplinger (not pictured, Dakota Shaw). The scholarships they received have the potential value of over 1/2 million dollars over the next four years. The students and the school want to thank all of the benefactors who provide these scholarships for our students. Your belief in the future of our children is immeasurable. Congratulations to all the recipients and we wish you well in your future endeavors.